The damage caused by shrapnel to the aircraft involved in flight MH17 could not have been caused by a modern Russian BUK missile, the manufacturers of the weapon Almaz-Antey have stated. The manufacturer staged two real-life tests involving decommissioned aircrafts and BUK anti-aircraft missiles to see whether missile complexes currently deployed by Russian troops could have been involved in the downing of the Malaysian Airlines aircraft on July 17, 2014. The experiments were carried out on July 31 and October 7 with the help of 9N314M BUK missile warheads, which are currently deployed by the Russian military. The results of the tests “decisively indicate” that an explosion from such a missile leaves a distinctive “butterfly-shaped” puncture holes due to the shape of the shrapnel, Almaz-Antey, the manufacturer of Buk air defense missile complexes, said. 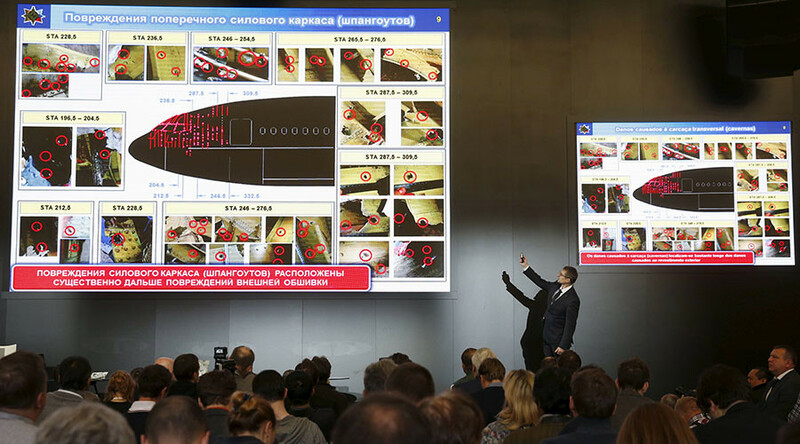 “The Boeing 777, which carried out the flight, did not have a single hole like this and as a consequence, this absolutely excludes the possibility of a missile with double T-shaped shrapnel being used to strike this aircraft,” Almaz-Antey stressed in a statement on Wednesday, following the final report of the Dutch Safety Board that looked into the causes of the crash. The Dutch Safety Board concluded the plane, which was carrying almost 300 people, was hit with a 9N314M-model warhead mounted on the 9M38-series missile. The weapon was fired from a BUK surface-to-air missile system from an area in eastern Ukraine. Almaz-Antey maintains that in fact a 9N314 warhead was responsible. On Wednesday, they commented on the differences between the two warheads and whose defense forces may have been using the missiles mentioned by the Dutch investigators. The manufacturer said the Russian army has not been using BUK missiles with 9N314 warheads filled with shrapnel different from a double T-shape, as these are “outdated,” while the production of such warheads was halted in 1982, Almaz-Antey stressed. Almaz-Antey also noted that as of 2005, there were 991 missiles armed with 9M38M1 warheads in arms depots in Ukraine. “We obtained this information through official channels. Back in 2005, the company conducted a pre-contractual engineering study of how long these types of missiles could be used for in Ukraine,” Almaz-Antey said, adding that they had a shelf-life of around 25 years. “We also have data that 502 missiles of the outdated 9M38 modification were used by Ukraine’s armed forces during the same year,” the company added. On October 13 the Almaz-Antey defense company presented the results of two full-scale experiments aimed at recreating the MH17 crash. The company concluded the missile that downed the flight was an old BUK model fired from a Ukrainian government controlled area, contesting the preliminary theory by Dutch investigators.